CC+S is partnering with the 21st Century School Fund, The Center for Green Schools, and the National Council on School Facilities to address the structural problems of inequitable and inadequate school facilities found in too many communities across the U.S. Through this initiative, six national cross-sector working groups have developed a menu of solutions to guide government, industry, labor, and the civic sector in the delivery of high performance public PK-12 infrastructure for all children. The six working groups are organized around basic elements of a well-managed facilities program: Data and Information, Educational Facilities Planning, Management, Funding, Governance and Decision Making, and Accountability. 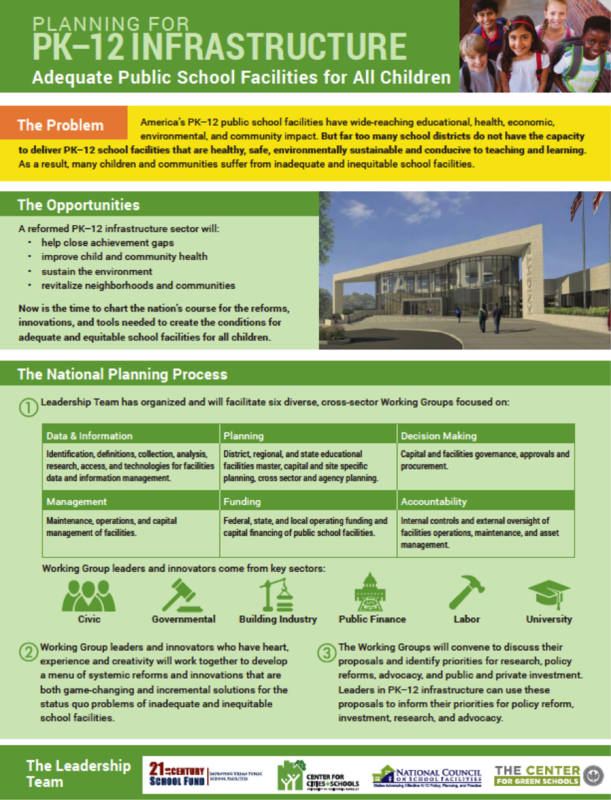 This map identifies policies, practices, and tools needed to structure, manage and fund the public and private capacity for equitable and efficient public school facilities for all communities. This initiative is funded by the Leadership Team organizations and the W.K. Kellogg Foundation.